The Dirty Beggars are an outfit from Central Scotland with the music of the Appalachians running in their blood. Their own brand of down and dirty bluegrass fused with traditional Celtic sounds has been electrifying crowds all over the UK and abroad. Comprising of guitar, banjo, fiddle, mandolin, harmonica and double bass – The Dirty Beggars are one-of-a-kind in the UK, akin to unique styles pioneered by Old Crow Medicine Show, Gillian Welch and the Dave Rawlings Machine. Their debut album ‘Bite The Bullet’ was released in 2011 to critical acclaim. A new EP ‘Time to Reminisce’ was released in November 2013 on the band’s own independent label – Wayward Sounds Records. In the past year The Dirty Beggars have gone from strength to strength. Highlights from the summer include a 17 date BORN IN THE WRONG COUNTRY TOUR of the United States where the band played at Floydfest, world famous The Bluebird Cafe in Nashville and filmed with CMT for their Concrete Country Series. The band also played a sold out show in Stavanger, Norway, and at Monaive Michaelmas Bluegrass Festival. The band has played at Dougie MacLean’s Perthshire Amber Festivals the last two years in a row. Last year, the band played at HebCelt, a sold out gig with Julie Fowlis at Innerleithen Music Festival as well as their first sold out gig abroad – in Stavanger, Norway. The Dirty Beggars performed a song on stage with Trampled By Turtles at Glasgow’s O2 ABC in January 2014. The band were featured as Open Mic Artist of the Month for February 2014 on FolkAlley.com. In March, the band played at the Country to Country festival in London’s O2 Arena and were house band on BBC Alba’s ‘Gun Sgot’ in April 2014. The band’s debut album ‘Bite the Bullet’ features 10 original tracks and has received airplay on BBC Radio Scotland by Ricky Ross’ Another Country Show and the Iain Anderson Show. The album was also featured by Frank Hennessey on BBC Wales and by Barry Marshall-Everitt as ‘Album of the Week’ on his acclaimed House of Mercy radio shows. The new EP has recently been played on BBC Radio Scotland by Bruce MacGregor (Travelling Folk) and Mary Ann Kennedy. 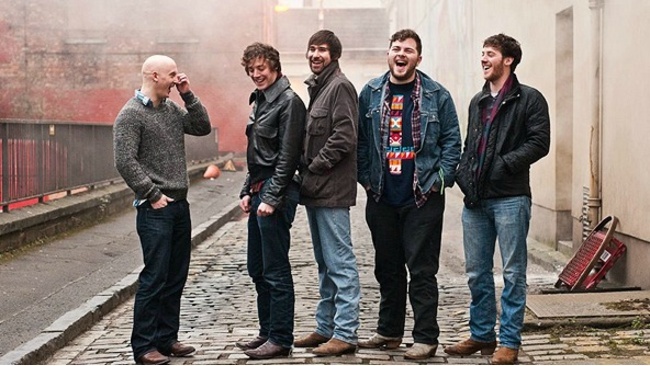 The Dirty Beggars commanded attention from MTV and CMT while in the US and filmed a session for the BBC in conjunction with Celtic Connections in 2012.